As a recruiter for nonprofit executives, I see the interview process from the perspective of the organization interested in hiring you. In my 17 years on the Campbell & Company Executive Search team, I’ve interviewed candidates for over 100 positions and counseled organizations through competitive searches and tough decision making. From the candidate perspective, you don’t know what’s going on behind the scenes, so the interview process can feel full of unknowns. To fill in the blanks, my colleagues and I put together a list of interview tips. Use this list to navigate your next interview with ease, from preparation to follow up. Our tips are geared toward in-person interviews, but most of them also apply to video interviews. Do your homework. Before you sit down for the interview, make sure you’ve read up on your interviewers, the position, and the organization itself. Review the annual report, follow the organization on social media, and read the recent news on its website. You should feel that you have a firm understanding of the organization’s top priorities and where it’s headed in the next few years. If the organization has a physical space that you can visit—e.g. a museum or a nature preserve—take a trip there and start to build your own personal connection if you don’t have one already. This “field research” will help you speak more convincingly about the organization in your interview. Finally, research the market salary range for the position so you feel comfortable sharing salary expectations if it comes up. To learn more, read my colleague Dan Nevez’s article that shares more extensive compensation advice in light of recent pay equity laws. Understand the commute. Particularly if you live far away from the office, your interviewers may ask about your commute. How long would it take? What route would you choose? Map out your travel plan so that you’re prepared to answer questions and show that the commute isn’t a barrier for you. Update your LinkedIn profile and review your social media presence. Double check that your LinkedIn profile matches your resume. Interviewers will often look you up on LinkedIn ahead of time, and inconsistencies can raise red flags. Read my colleague Joey Scheiber’s article on crafting a strong LinkedIn profile for additional advice. More broadly, scan your footprint on social media to ensure that nothing appears unprofessional. If you find anything suspect, err on the side of caution and delete it. Practice telling your story. Get comfortable sharing a three to five minute narrative about your career path. This is similar to an elevator pitch and should include an explanation of why you were attracted to the position and why you care about the organizational mission. To refine your story further, record yourself on your smartphone or computer and watch the video to pinpoint areas for improvement. You should also have several examples of what you have accomplished—on-the-job stories that showcase your aptitude and experience. As you prepare these stories, be sure you don’t take undue credit. For instance, if you manage a team, recognize their contributions rather than only using “I” statements. Be prepared to discuss any sensitive or difficult topics. Maybe you have a gap in your work history or you didn’t leave your last position on the best terms. Whatever the situation, practice sharing this information in a tactful, honest way. As you progress through the interview process, the topic will come up, so it’s better to be upfront. Above all, don’t try to mislead your interviewers. Whatever you claim will be verified later on. Jot down two to four questions for interviewers. These questions could be about the position itself, the organization, or the organization’s future vision. Whatever you ask, be thoughtful and genuine. What do you want to know? What will help you make a better decision? Choose your outfit intentionally. What you should wear to an interview varies from organization to organization, but when in doubt, default to the most professional option. Whatever you choose, make sure you feel comfortable and confident. Arrive early—but not too early. Punctuality is a make or break for interviews, but it’s also important not to show up 30 minutes beforehand. The organization may be interviewing other candidates directly before you, so aim to arrive 5-10 minutes ahead of time. Approach the interview as an opportunity to determine mutual fit. 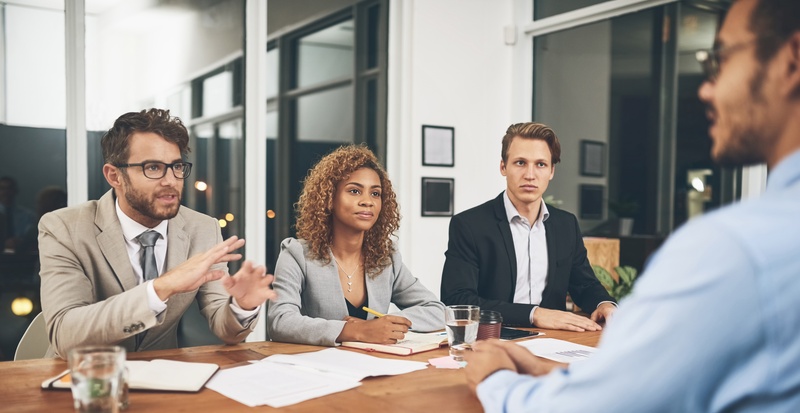 Yes, you are being evaluated, but an interview is also a chance for you to learn more about the position and understand whether it’s the right move for you. Take notes. There’s no need to record everything that happens, but jotting down key information shows your interest in the position and can be a helpful resource later on. When your interviewer asks a question, write it down as a point of reference for yourself. This will help you stay on topic when answering a more involved question. Bonus points if you take notes on the position description beforehand and refer to it during the interview. Stay on point. Interviewers typically have a specific number of questions that they plan to ask, so strive to give succinct answers. A brief overview with an example (if appropriate) will usually suffice. Highlight your successes. An interview is not the time to be humble. Communicate your impact and take credit for what you’ve accomplished. 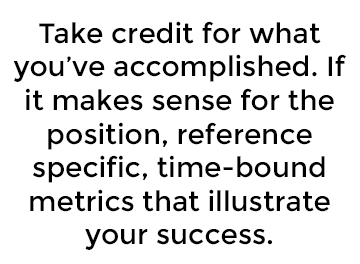 If it makes sense for the position, reference specific, time-bound metrics that illustrate your success. This is particularly important for fundraisers. Make sure your answers match the information on your resume. Just as your LinkedIn profile should match your resume, your interview answers should also mirror it. If you say you brought in $1 million in major gifts in the last fiscal year, but your resume reports a smaller number, it looks sloppy at best and deliberately misleading at worst. Adapt your body language based on the number of interviewers in the room. If there’s only one interviewer, you should obviously make eye contact and direct your answers toward them. But if you have two or more interviewers, things get a bit trickier. Each interviewer likely has their own share of assigned questions. As a guideline, address the person who’s asking the question, but involve and address everyone through the course of your answer. Let your personality shine through. Your qualifications and experience matter, but many interviewers double as your future colleagues. They want to connect with you and assess whether you will be a pleasant person to work with. Ask about the hiring timeline at the end. When the interview is wrapping up, check in about next steps in the process. When can you expect a response? What will the next round look like? If you have follow-up questions, do they prefer a phone call or an email? Thank your interviewers individually. 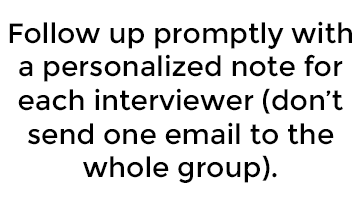 It’s important to follow up promptly with a personalized note for each interviewer (don’t send one email to the whole group). An email or a notecard sent through the mail are both viable options. You could also opt to send both, but make sure that they have different messages. Start thinking about who to select for references. After the interview, it’s a good time to give some thought to references. Select carefully. You should only use connections who can truly speak to your work—not someone who supervised you 12 years ago, unless you’ve kept up the relationship. Three to five references is standard. Make sure to choose a range of references, such as a supervisor, a peer, and a direct report. A nonprofit donor can serve as a useful reference, as well. Use the hiring timeline as a guide for any follow up. Since you asked your interviewers for a timeline at the end of the interview, you’ll know when it’s appropriate to touch base. If you haven’t heard back by the stated time, feel free to reach out with a simple check-in. Have you researched the organization and your interviewers? Have you practiced sharing your story, on-the-job successes, and any sensitive topics? Do you have two to four questions prepared? Are you 5-10 minutes early, dressed appropriately, and prepared to take notes? Are you staying concise, highlighting successes, and being yourself during the interview? Post-interview, are you prepared to send a personalized thank you note to each interviewer? Have you started selecting your references? We hope these detailed tips serve as a guide during your next job search. Don’t hesitate to contact me with questions and happy interviewing!